In a state-by-state breakdown of unemployment rates by race and ethnicity for the fourth quarter of 2018, Valerie Wilson, Director of EPI’s Program on Race, Ethnicity, and the Economy, shows that while there have been nationwide improvements in prospects for black and Hispanic workers, their unemployment rates remain high relative to white workers in almost every state. Of the states for which data are available, the unemployment rate for African Americans was lowest in Virginia (4.3 percent) and Florida (5.1 percent). The highest African American unemployment rate was in the District of Columbia (11.8 percent), followed by Pennsylvania (8.9 percent), Illinois (8.8 percent), Louisiana (8.0 percent), and Mississippi (7.7 percent). 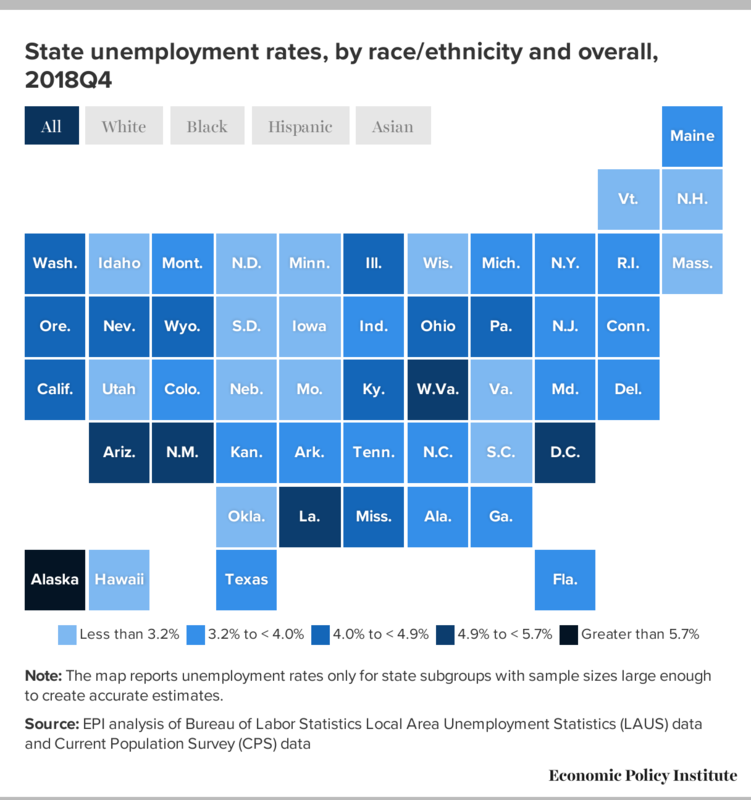 The black unemployment rate was higher than the white unemployment in all of the states for which data are available, but the largest disparities were in the District of Columbia (5.7-to-1) and Alabama (3.0-to-1). Ohio and New Jersey had the smallest black–white rate gaps—black unemployment in Ohio and in New Jersey was 1.6 times the white unemployment rate. The highest Hispanic state unemployment rate was in Washington (7.5 percent), followed by Pennsylvania (7.1 percent), Arizona (6.3 percent), Connecticut (5.8 percent), and Oregon (5.8 percent). The Hispanic unemployment rate was actually lower than the white unemployment rate in Georgia (0.8-to-1) and Oklahoma (0.9-to-1), but it was more than double the white rate in Nebraska (2.4-to-1), Virginia (2.3-to-1), and Connecticut and Pennsylvania (2.1-to-1 each). Meanwhile, the white unemployment rate was lowest in South Dakota (1.5 percent) and highest in West Virginia (4.6 percent). The Asian unemployment rate was lowest in New York (1.9 percent) and highest in Washington (4.8 percent). This analysis, which is produced quarterly, was delayed due to February’s government shutdown, which delayed the release of Local Area Unemployment Statistics (LAUS) data and Current Population Survey (CPS) data.